This is from the January 1995 edition of CDROM Today. Now that I’ve dealt with the Succubus, my mission for the rest of the game is going to be to look into the mysterious goings on with a new building that is being built in Noctropolis called the Sunspire. This building is going to be so tall it goes through the cloud cover and you will be able to see the sun from the top. I start off my investigations by trying to talk to the boss of the firm building it, which means a load of puzzling to get to see her. In this scene my partner Stiletto has to use her wares to persuade the repairman to turn on the air conditioning, to set off a long and unlikely chain of events leading me up to the top floor and the bosses office. I said yesterday that the acting wasn’t too bad in the game but this scene falls under the so bad it’s good category and it won’t be the only one from the rest of the game. I always loved the 70’s Batman so I’m all up for some ludicrous comic book dialog with matching acting and there a good few scenes like that in the rest of the game. Watching these two trying to overact each other has to be the highlight though. The boss appears to value her office space. I grill her for information but I don’t get much more than a hint to look into the gardens. I access the greenhouse with the aid of a glass cutter that just happened to be lying around earlier in the game only to get trapped and stung by a load of mutant plants. This is the 2nd of the villains that escaped from the prison. He was saved from death by plants giving him mutant plant powers in the process (No, I’m not making it up), and after telling me he is on his way to the opera house, he leaves me strung up. I work my way through likely items in my inventory until I find that I can release myself with the liquidark grenade. I’m on a timer again, having been stung, so I go back and heal myself in the liquidark bath. This will become a habit after I meet every villain. I head to the opera, only for Stiletto to be captured by villain #3, Tophat. She is a theatrical psychopath, who appears to have magic powers judging by the way she teleports Stiletto onto the stage. She uses her as a hostage to force me to get the lens from the observatory, so I head on over there and once again all the items I need happen to be on the floor in plain sight. The snag here is the searchlights that I have to maneuver through but I steal the lens and head back. Unsurprisingly, Tophat doesn’t keep the bargain and I end up being knifed on a spinning disk. This game can be moderately gruesome at times like this. I escape and heal once again and after exploring the theatre learn from a group of gang members outside that they saw a butchers van leaving. At the butchers, I sneak into the back and find Dr. Macabre operating on Stiletto. I’m just in time to see him slice off one of her fingers and throw it at me. He gasses the room I am in and I end up on the table myself but we manage to escape killing him in the process. We then have to find our way out which leads through some very strange areas, and even stranger people like this guy who has been deformed by Macabre and is guarding the door. Rather than just setting Stiletto on him, I have to bargain my way past by offering make-up so he can go out into the real world again…. I’ve then got the one puzzle in the game behind him where I have to get the dots lined up by colour by moving them around. This takes a while, but I escape in time to heal myself once more. When I’m healing there is some FMV where Stiletto starts to undress only to sprout a new head. The final villain called the dreamer has trapped me in the dream world with his evil telepathic powers and I’ll need to escape. We always have to get an obligatory breast shot in these “adult” FMV games I’ve noticed. I can only conclude that game developers, given the opportunity always make sure there are a few scenes like this. The dream world is possibly the most interesting section of the game with a creepy fun fair to look around. Through a somewhat convoluted set of puzzles, I end up at the top of a tower and meet the Dreamer again. He pushes me off the building only for me to die at the bottom waking me from my dream. From here it’s back to talk to the woman in charge of building the Sunspire, who finally sends me to meet her boss who is known as The Whisperer. This guy hangs around beneath the building and looks somewhat out-of-place as a cartoon, but is supposedly an elemental. He actually wants to help me stop Flux and tells me I need to get to the top of the Sunspire building. I make my way there, picking up an unlikely series of objects in passing. Some of the puzzles in the game are just silly and it’s a good job the item interface works the way it does or I could have been stuck for days. For instance in this room I’m supposed to know that to get rid of the guard dog on the platform, I need to use a rope with a sausage and then use the rope on the little pipe. The dog will then jump for the sausage, plummeting to its death while also pulling the rope further around the girder in the process. I can then use my meat hook, stick & duct tape together creating a hook on a pole to snag the rope and swing across to the platform. Rather than having to figure any of this out, I just try to use the sausage and the game decides to use it with the rope, then I use the new item and it decides where and how. Using the meat hook has the same effect. I’ve never played an adventure game that didn’t require you to know what you were doing with your items in this way. It does take a lot of the adventuring away from the game and turns it into an item/location hunt. At the top of the tower, in a ludicrous Flash Gordon suit is……..Darksheer. Like I didn’t see that one coming within 5 minutes of starting the game. He is now calling himself Lumasheer and is using the power of light instead of dark. It turns out that my whole quest was a ruse to keep injuring me and getting me to heal myself, thereby getting the liquidark to run through my blood. He can then use my blood with his liquilight to form a new substance called the Quintessence Of Light which will make him all-powerful. In the games final puzzle I have to use the other token I got to send the new substance to my world. At this point, a figure from the Brotherhood (who taught Darksheer about liquidark in the first place) appears from nowhere and chops his head off. He apparently couldn’t interfere until nature itself was threatened which is why he only showed up in the nick of time. I now get to be the new Darksheer and guard Noctropolis from future threats. Back on my world a new Darksheer comic book mysteriously appears and the game ends with many outtakes from the filming which are for the most part less amusing than the takes that did make it into the final game. I’ve skipped most of the puzzles here. If you really want to see the whole game, there is a full playthrough already on Youtube. I’ve thoroughly enjoyed this game and it’s one of the better FMV efforts that I’ve played but I’ve seen plenty of better designed adventure games. Large portions of the plot and dialog are ludicrous but it gets away with it through not taking itself seriously, although it contrasts this by being quite dark at times with some of the subject matter and situations. The biggest problem I have with the gameplay was hunting around the screen for some of the items you can pick up. Most items stood out against the background but several were indistinguishable. Other negative aspects were that I did feel like I was just carrying out tasks for the sake of it a lot of the time, with no real idea why until after I’d done it. You could level that criticism at a lot of adventure games but this was worse than most. It’s also not the longest of games. So that’s the final day of Origin games, at least until I discover another game or decide to give Ultima Online a go. It was a fun game to finish on even if it wasn’t actually done by Origin. From here on its book reviews and some of the remaining games from fans and Origin developers. As far as games go, the ones I’m definitely going to be playing are Lazarus and it’s Ultima 6 equivalent (these 2 are top of the list), Arx Fatalis, Netstorm, Starlancer and Freelancer. The end is nigh…. This is the final “Origin” game that I know about although it’s stretching a point to call it an Origin game. It was developed by Flashpoint who were an independent developer and published by EA. That doesn’t initially tie it to Origin at all but as I’ve mentioned in previous posts, the testing on the project was headed up by Origin employees, Origin published the clue book for the game and they also provided telephone/written support. Despite it saying EA on the box, I’m suspicious that the game was effectively published by Origin but this is pure speculation on my part. At any rate there is enough of a link there for it to make it’s way into the blog. I am going to play some more of the Origin related games after this but I think that I’ll just write a review at the end rather than a day-by-day account. I’ll probably concentrate more on the books as I’d estimate that I have about 40-50 of them to get through. The only other possible Origin games that I know of were a few American football games that were done at Origin around 2002-2004. I think these were done in the same building but not actually by Origin. I might have a look at these some time but sports games don’t appeal to me all that much and it wasn’t really Origin by that time anyway. Richard Garriott had already gone and it was around then that UO2 was cancelled taking many Origin employees with it. 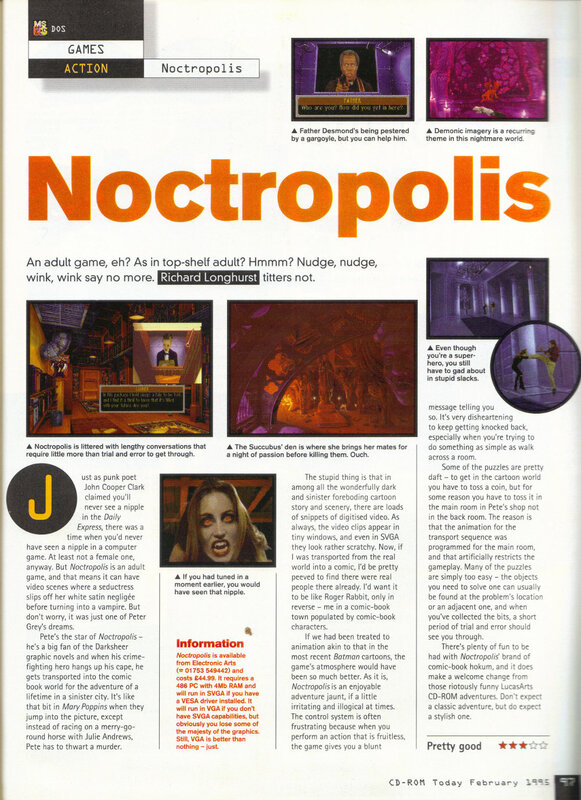 Noctropolis, however, was published back in 1994 when Origin was still turning out many of it’s best games. Noctropolis is the first and only point and click adventure game that I’ll be playing on here. This is my favourite genre and I don’t get to play many new point and clicks these days so I expect I’m going to enjoy it. The majority of the game is going to be spent in the comic book world of Noctropolis. This is a Gotham-esque city of permanent night (thanks to dust clouds thrown up in an old war) populated by numerous super-villains, who you get to see in the games extremely brief introduction. There is also a comic book that comes with the game, that sets the scene far better but since the book is reproduced entirely within the game, I’ll leave that until I get to it. I’m going to be playing a comic book store owner called Peter Grey. I start off the game in my real world comic book store. I’m apparently a huge fan of Darksheer, the dark hero of Noctropolis but the series has been cancelled recently. The interface is fairly standard point and click but manages to be more cumbersome than it needs to be. Right clicking brings up the giant triangle shown on screen here. It uses text rather than the usual pictures and has what seem like an unnecessary number of verbs but it works reasonably well for the most part. It’s not always intuitive to use though. For instance the use button only applies to inventory items so to knock on a door I have to move it. My main criticism would be there isn’t enough feedback as to where interactable items are on the screen. In Sierra games you could see them a mile off as they didn’t blend into the background. Here you can’t easily spot them and with no feedback as to what you are clicking on this could make for some potentially frustrating adventuring. Why Flashpoint didn’t just copy the interfaces from established companies like Sierra or Lucasarts I don’t know. On the other hand if you want to use an item, then you don’t get to choose what to use it with and it will automatically use it anywhere in the room so this is arguably a little too simplified. Apart from picking up a few bills, there isn’t a lot to do around my comic store. It just consists of the two rooms with a front store area and a small office in the back. I don’t walk my character around in this game although he does plod around the screen when I carry out actions. This is similar to Phantasmagoria in this sense. It also has the digitised actors on a drawn background. These do stand out from the background and move around quite jerkily but they don’t look too bad on the whole and the background art is excellent. In the back of my store, I find and read the final Darksheer comic. In this Darksheer kills or captures the final 3 villains of Noctropolis before retiring and leaving his partner Stiletto (breaking her heart in the process). Rather that just showing the pages as in the printed version, you click on each segment and get the lines acted out. After reading the comic, there is a brief cutscene as a woman materialises out of nowhere, only to turn out to be a vampire. I wake up from this nightmare to my doorbell ringing before it gets too nasty. At the door is a short girl who only talks in rhymes. I’m presented with a series of dialog options and I’ll be seeing a lot of these throughout the game. I establish that I’ve won the “Want to be Darksheer for a day?” sweepstakes and hand over my ticket stub to get my parcel. The conversation is entirely done in FMV on her side, with my options just being clickable text. You will notice that the video is surrounded by the door and this technique is used frequently throughout the game as a means of framing the video clips. As far as the acting goes, from what I seen today it’s not too bad for an FMV game. It’s comparable to something like Under a Killing Moon although there is considerably less of it than in that game. There are times where it hasn’t been edited especially well. There was a conversation later on in the game where the guy I was talking to kept getting nearer and further away depending on which option I chose. The music is all done with MIDI and isn’t bad at all through a Sound Canvas. Overall the game generates a good atmosphere. Getting back to the story, in my parcel is a new unpublished Darksheer comic. This tells the tale of some shady villain called Flux who rescues 5 super-villains from the jail who then take over the city in Darksheers absence. Darksheer’s ex partner Stiletto has shut herself off since he left and the city is unable to cope. A priest affiliated with the heroes attempts to summon Darksheer in a ritual to end the comic. I’m only guessing here but it all seems a bit coincidental that Darksheer vanishes and a new villain (who happens to wear a cloak obscuring his features) pops up immediately. I expect they will turn out to be the same person but I’ll have a lot of game to play through first. Other than the comic, there were a couple of tokens in the package. In a typically obscure adventure game puzzle, using the silver one in the shop inexplicably conjures up an obelisk…. …which transports me to the world of Noctropolis. This is where the game starts for real and I get to explore the city and meet a few of it’s inhabitants. The initial section deals with trying to meet Father Desmond. He was the priest who tried to summon Darksheer at the end of the comic. After puzzling my way past an animated gargoyle, I find him in his confessional and have to try to talk him over to my side with the correct conversation options. This takes a while and I end up playing this over and over, with him either killing me or sending me away every time. It’s quick enough to reload and try again but a little tiresome. This is not a game that holds back from killing you frequently so save games are essential. I don’t mind this too much, provided there are no dead ends. The conversation system is more or less exactly like the ones used in Martian Memorandum and requires a load of retries until you stumble across the combination of choices that the developers wanted you to pick. It comes close to being annoying but just about avoids it as it’s quick to repeat and try again. When I get the options right, Father Desmond suggests that I should be the new Darksheer and sends me over to Stiletto’s to try to talk her into helping. She answers the door drunk and after picking every option I can’t talk her into helping so I give in for now and pursue the other clue I got from Desmond, a jaw bone. Why he gave me this I don’t know, but through a DNA analysis at the hall of records I learn who it belonged to eventually leading me into the lair of the Succubus. She is one of the 5 villains I need to stop before I get to Flux. I don’t do too well though as she seduces, rapes and then bites me. When I wake I have an 8 minute timer before I die to escape from her lair and heal myself. I learn from her diary (written in blood) that the Succubus is a nun who was possessed by a demon, during a exorcism by Father Desmond which is why she wants revenge on him. She wants a new body and is now pregnant thanks to me, so has that in hand. Suffice to say, I escape get back to the cathedral and thanks to Stiletto turning up at the last moment, kill the Succubus with holy water before being taken to Darksheers lair. Darksheer’s powers came from the study of light and dark by a group of monks and thanks to his supply of liquidark I’m healed and ready for the fight. I manage to impress Stiletto by beating her in a fight (using an unlikely series of moves for a comic book store owner) and then take Darksheers suit and head out with her to clean the streets for decent law abiding citizens…. This is looking like quite a decent game from what I’ve seen. It’s amazing how many obscure adventure games there are out there like this that slipped under the radar first time around but which I can go back to now, given the lack of new ones. I’ve never read any superhero comic books but the game appears to capture the feeling of these from what I do know. It’s a little corny but thats as it should be if you are going to do a comic book game. Initial impressions are that this is well presented and reasonably challenging but not too frustrating thanks to the linear nature of the game offering limited options. It is a little clumsy in some ways and doesn’t have the polish of one of Lucasart’s classics but I like the genre enough for this not to put me off at all. I’ve got the clue book if I need it which has very useful hotspot screenshots to highlight interactive areas of the screen. This is all I’ve needed so far to point me to a solution I was struggling with. This provides a workaround to the slightly dubious interface but I’ll avoid using it other than that, and only resort to using it at all if I’m stuck. It doesn’t strike me as a game that would convert anyone to adventure games but if you are already a fan and looking for something new, this could fit the bill.